Good blog Phil - you outline the industry very well. Is this market all about acquisitions, or are there firms doing this organically? Apart from affecting the bottom line, one should also consider the actual realisable benefits these M&A ventures have brought for the parent org. along break even predictions. Perception & double entry book keeping can be only visible benefits thus far. @Dipayan - a very pertinent point. 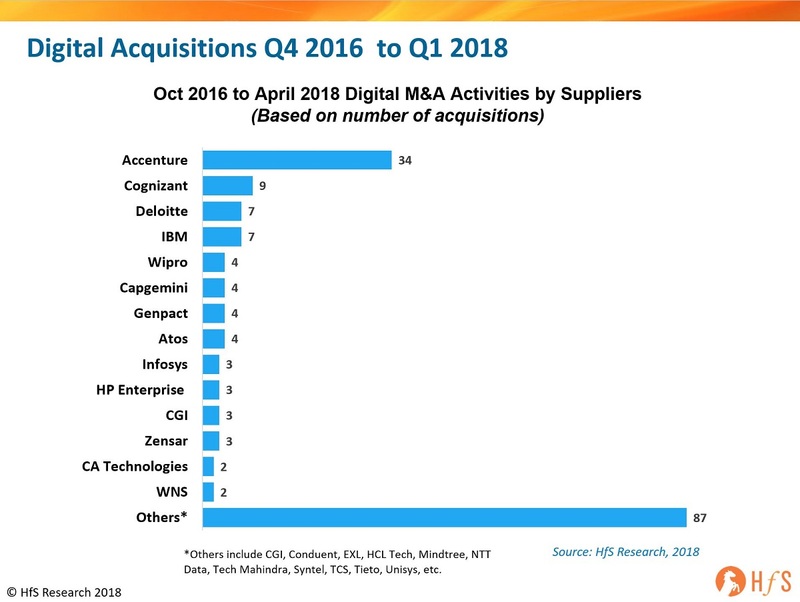 Accenture has taken a while to get their M&A on track in this space, but agree reusing these assets is a big challenge, and explains why most these current acquisitions are relatively small and low risk. Interesting view of investment by the market leaders. Cognizant has quietly established great capability in this area and I suspect their corporate culture leads to more rapid integration of capabilities. Excellent work Phil. Infosys needed some direction and this seems like a good start, not only picking up some digital capablity but publicly stating they are selling off assets that are not key to where they want to go. Let's hope we don't get another leadership drama like last time! @Anildeep - most of these acquisitions are centered on adding talent with the creative, technical and business acumen to design solutions with clients and help implement them. It's a costly exercise to grow piecemeal like this and very easy to execute the M&A poorly and lose what you bought quickly. Accenture, as an example, made the mistake of trying to "Accenturize" acquisitions too quickly and ended up losing much of the talent, culture and clients that came with it. They course-corrected with Fjord and now do a much better job maintaining the DNA of what they bought and building it into a less "forced" model where creativity is widely encouraged and continuing the business ethos as before, but with the Accenture resources behind it. Cognizant and IBM are also going through similar experiences with their acquisitions. Wonder if there is a more of regional client acquisition play ( + localisation spread ) to this than just plain digital offerings to the acquisition strategy . Cognizant seems to have a focus on European markets + ANZ , Japan and none in US . No players except for IBM has acquired Indian companies . A lot of focus here on M&A for digital - what about growing organically? Your two paragraphs in reply to AnilDeep pretty much capture the gist of this predicament succinctly. Agree with all of it though the absolute last bit has far reaching consequences (....benefit from large acquisition). I think strategy (in your actions) in such a space must stem from clarity on goals, competition moves and your timing. Then execution and course corrections along the way. Are you intending to build capability through small acquisitions and then evolve organically to compete forward and create your marketspace/share? (OR) Are you intending to build capability AND revenue volume at scale, to then establish a leadership beachhead quickly to defend? And what is your timing? I guess some firms have realized so very late that the revenue volume is at the first level of digital (the digital marketing, consumer/employee/partners focussed agencies, the last mile digital etc. ), than at the layers above (AI/ML/Automation and Industry 4.0 and beyond) albeit fragmented and local. They are grappling with this however because everyone is rushing in, so the ones doing it consistently with a strategy and over time (Accenture) may do better over the occasional digibuys so late in the game. If the intent is to build the (creative + technical + business consulting) talent pool to useful scale, would it not serve them better if they marry these small local acquisitions in a SFO or a Sydney or a Toronto to similar acquisitions in India and elsewhere in Asia, build a network that operates locally and globally? Without a really well thought/planned strategy on this they will "......lose what you bought quickly" and go nowhere. And would it not be a good thing to build+buy a 30M digital agency in India and work locally, if you are an Indian HQ tech firm then expand the network? Do they have comparable experience and record in their own backyard first? To the point about having to buy something at scale quickly (whence already behind) and so the need to take more risk and therefore a bigger "agency network" acquisition, the challenge is in managing the outcome if the big decision goes south especially after a few recent bold moves have been so embarrassing. Also notice how poorly these firms fared in even building consulting to scale (neither organically nor the big bang acq. there) in the good years that went past. Maybe a Cognizant could do this (a big bang acq.? ), than an Infosys. They are somewhere in the middle (of Accenture and the rest) on their strategy. Plus they have shown the ability to do acquisition at scale, consulting at some scale. @Andy - if the goal is to design digital business models for clients, then the IT services firms simply have to buy in the skills to get a start in this space. These services firms have been built up over decades to deliver and manage technology implementations - at scale - not to design new revenue models through digital channels. In short, today's IT services firms are engineers, technologists and transactional processors steeped in Six Sigma and LEAN, and this shift to digital solutions is forcing them to develop creative and entrepreneurial skills to be true co-innovation business partners with their clients, where digital technology is core to those business models (see the talent needs from clients in an earlier post. Once these providers have brought in enough talent which is located geographically close to its clients, they can start to develop more inhouse training to add depth and scale - and I would argue only Accenture is really at the point where it has sufficient scale to push organic growth through is substantial portfolio of agencies. I would also make the point that a lot of this organic digital growth can only be effective if there is a significant cultural shift towards more of the right-brain design thinking skills - and this is something that will take these firms years to cultivate. Hence, acquiring agencies and other digital people assets has to be through multiple geographic acquisitions, mergers or carve-outs in the initial phases to get enough depth to drown organically. There is a possibility of a firm like Infosys, TCS, HCL, Cognizant etc moving faster by acquiring a larger digital media asset, but this increases the risk significantly if that acquisition fails. We also need to be mindful that adding the "digital right brain" to the "services left brain" is a major cultural change that will take years to make truly effective. Remember all the telecoms firms which went bust after Y2K because they failed to diversify their services beyond networking... it's not so different from today's IT services firms looking t add the digital business acumen.